The SEBA method has been newly developed within the BONUS BALTSPACE project. The tool aims in contributing to a better understanding of socio-economic consequences of MSP and in providing MSP practitioners with a tool that helps them to take sound decisions. More specifically the tool is developed to identify and map the spatial distribution of benefits associated with a given set of maritime uses. How are benefits of marine/maritime sectors allocated across the country? Socioeconomic aspects are currently rather marginally covered in MSP. To provide maritime spatial planners with a suitable tool to integrate those aspects into their decisions, the Spatial Economic Benefit Analysis was developed. The tool aims in contributing to a better understanding of socio-economic consequences of MSP. Shipping, offshore wind, fishing, marine tourism, sand and gravel exploitation, cable and pipelines and aquaculture/ mariculture are fields of interest for this analysis. The listed sectors are quite divers, so that a solution “one approach fits all” does not seem realistic. Therefore shipping and offshore wind have been chosen for full analysis, including the development of an appropriate tool and its empirical testing for the case of the German Baltic Sea Region. Stakeholder integration: Economic benefits are important values for entrepreneurs, employees, regional politicians and other stakeholders. Including a spatial analysis of economic benefits in different sectors using the sea enables integrating those stakeholders into the MSP process. Land-sea integration: decisions concerning the use of the sea do have socio-economic consequences on land, for regions at the coast but also inland. The tool helps understanding those relationships. Transboundary integration: even if only indirectly, the tool enables analysing the distribution of economic benefits also across borders. Economic benefits do not stop at national borders. For the sector analysis, the concept of value chains is helpful to get an overview of different beneficiaries and their tasks within the sector. The brainstorming aims in answering the question: Who will be affected by changes in the maritime spatial plans? Who gains through the expansion of a certain sea use and who loses if a certain sea use is restricted? Data collection is the most time-consuming task of the tool. Usually the needed data is not available in a compiled ready-to-use version. The availability of data depends on the region, the sector and the chosen approach. Possible sources are statistical offices, sector associations, thematic fairs and events as well as contacting the actors directly. The database development aims in harmonizing the collected data and bringing the raw data in the right shape for mapping. For the actual mapping, different software programs can be used. Point, line and area signatures as well as diagrams are offered by those programs to present the geographical distribution of benefits. Last but not least, the analysis of the maps gives you answers to the question: How are benefits of marine/maritime sectors allocated across the country? The analysis of the offshore wind energy sector for the German Baltic Sea region revealed two main findings. First, many but not all enterprises involved in the planning, constructing, installing and maintaining of offshore wind farms in the German Baltic Sea area are located at the coast. The location depends also on the respective subsector. Service companies are rather located at the coast, while owners, operators and investors, might just as well be located far away from the sea. Second, the share of national enterprises contracted, depends on the operator of the wind farm. 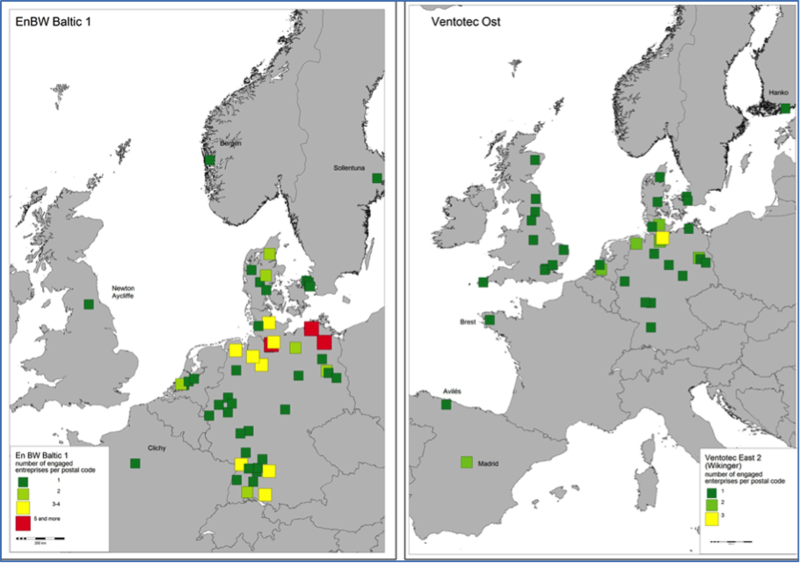 Offshore wind farms operated by a German company or consortium (e.g. EnBW Baltic 1) show a higher share of German enterprises involved. The following maps underline those findings and give an impression on how the main output of the tool looks like. 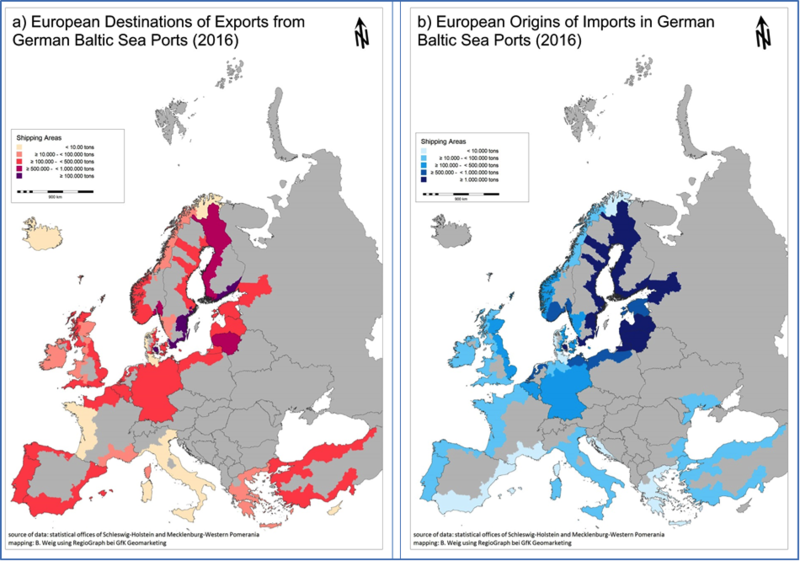 The analysis of the shipping sector revealed also two main findings: First, most goods handled in the German Baltic Sea ports origin from or are shipped to destinations within the Baltic Sea region. Other European ports are also important destinations and origins. Non-European ports though only play a minor role. Origin and destination however differ substantially when analysing different groups of goods. 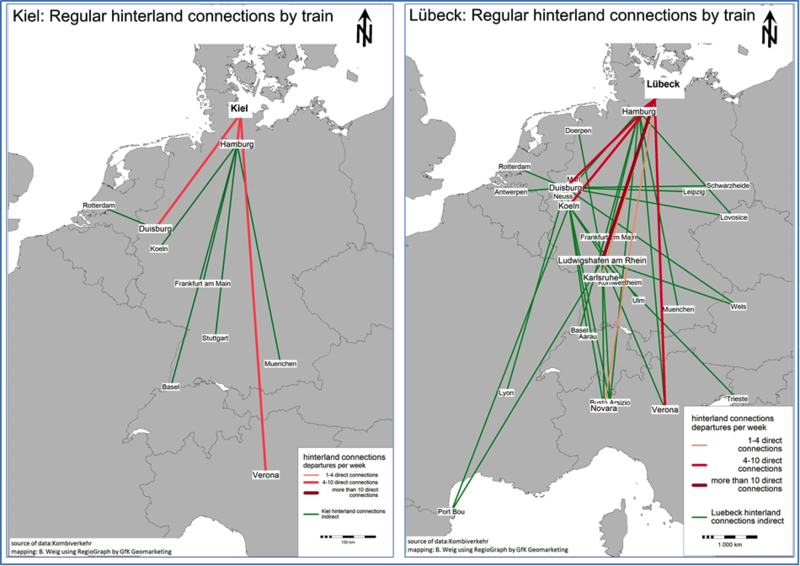 Second, the main hinterland connections link the German Baltic Sea ports with the industrial centres in Germany. However there are also connections to other European destinations, mainly in so called land-locked countries, such as Switzerland, Austria and Czech Republic. Moreover, hinterland connections between the Baltic Sea ports and ports in other sea basins exist, e.g. to the big North Sea ports of Rotterdam and Antwerp and to the Mediterranean. The following maps substantiate the findings. The Spatial Economic Benefit Analysis is transferable to any region and to different scales. However the approach has to be adapted to regional specifics and depends on the availability of data.